The Crunchly saga begins here. 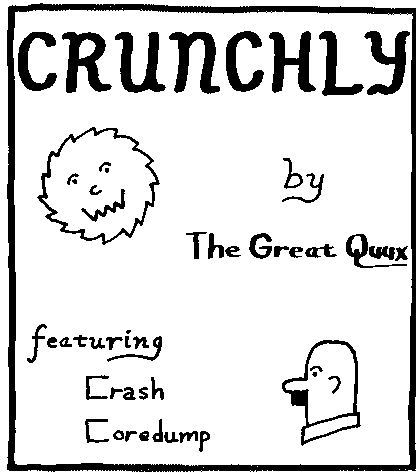 The infamous Crunchly cartoons by The Great Quux are woven into the lexicon, each next to an appropriate entry. To read them in the sequence in which they were written, chase pointers from here using the ‘next cartoon’ information in the captions. A few don't have next pointers; these are vignettes from the 1973 Crunchland tableau spread that inaugurated the strip. Here is a framed version of the glossary.